Southern Madagascar has been hit by consecutive droughts. United Nations agencies are calling for immediate financial support for farmers and families in Madagascar in order to address the growing food crisis that could worsen if crops are not planted by December and January. The Food and Agriculture Organization of the UN (FAO) hopes to provide 170,000 farming families in the most food-insecure districts throughout southern Madagascar with plant cuttings and seeds next month. As part of the World Food Programme (WFP) relief plan, they will also receive food or cash to ensure they are sustainable until the next harvest in March and April. Since June, WFP has been distributing food to people in areas with the greatest need, as well as providing cash in areas with functioning markets. According to the latest Integrated Food Security Phase Classification (IPC) findings, some 850,000 people, or half of the population in southern Madagascar, are facing hunger and in urgent need of humanitarian assistance. The findings are an indication that food and nutrition security could worsen in the coming months unless humanitarian efforts are rapidly scaled up. 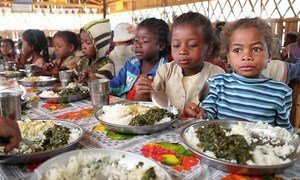 In southern Madagascar, some 1.4 million people are considered food insecure. FAO is sourcing sweet potato and cassava cuttings, as well as a variety of drought-tolerant seeds and tools for smallholder farmers. Families with livestock will receive additional support. “But, through a joint response, [FAO and WFP] can begin to turn this situation around, not only by providing immediate relief but by giving communities the means they need to feed themselves,” she noted. Ongoing droughts in Madagascar have led to significant declines in the production of maize, cassava, and rice production in the southern parts of the island. Moreover, rising prices are reducing peoples’ purchasing power and eroding food security of those who are most vulnerable. Many households have already adopted survival strategies, including eating less frequently, selling animals, agricultural tools, and even land. WFP and FAO have secured funds to launch the initial stages of their joint planting assistance programme, but cannot reach all drought-hit farms without additional financing. FAO has received $4.5 million of the $22 million needed. WFP’s drought relief operation, to continue until March of next year, is $50 million short of the $82 million required. FAO’s immediate plan is to target 850,000 people, including 170,000 small-scale farming households in areas most-affected. Their assistance includes support for the planting season and livestock production. WFP will continue with food and cash relief operations to reach some one million vulnerable people by the end of November. The agency is also expanding its nutrition programme to prevent and treat malnutrition among more than 200,000 pregnant women, as well as nursing mothers and children under the age of five. Some 230,000 school children are being provided with daily hot meals. The impact of severe El Niño-induced drought on crop production in southern Madagascar, where nearly 850,000 people are acutely food insecure, is likely to persist into 2017 and requires an intensified humanitarian response, the United Nations agriculture agency said today.